If there is any doubt that Thomas Erskine, M.D., is crazy about dirt bikes and motorcycles, look no further than his cell phone. It’s encased in rubber that looks suspiciously like tire treads, and it doesn’t ring—it revs up like an engine. And then there’s the two dirt bikes (a KTM 450 XC four-stroke, and a KTM 300 XC two-stroke) and the Harley Davidson that sit in his Napa garage. You might think it was a lifelong passion, but NorthBay Healthcare’s new Chief of Staff— who divides his time between practicing internal medicine at the Center for Primary Care in Vacaville and serving as the medical director of the Center for Wound Care—has only been involved in biking for six years. 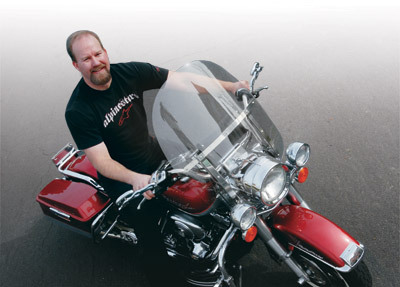 “My dad always rode motorcycles, and about six years ago I decided I wanted to buy a Harley, so we could do road trips together,” says Dr. Erskine. 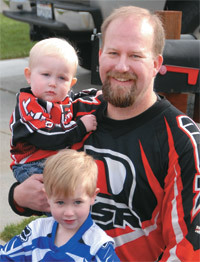 Then a year later, his brother-in-law introduced him to dirt bikes. Now he’s got the bug, and loves his off-road adventures. They’ve gone to Baja, California, and have found miles and miles of dedicated tracks and trails in Northern California. He’s active in the American Motorcycle Association’s District 36 and has joined the Valley Climbers, which puts on annual Enduros—100-mile, off-road races in which up to 250 participants compete against the clock for trophies or plaques. It’s a family affair at District 36 events, says Dr. Erskine, with riders ranging in age from 7 to 82. His own two boys—at ages 3 and 1—are still too young to get behind the wheel, but that hasn’t stopped him from giving the 3-year-old what looks to be a mini-dirt bike—with training wheels. “It’s a family-friendly environment,” he says, noting his wife and family come along for the day.